Hello to all of my fellow fashionistas and followers...hope you had an awesome 4th of July weekend! Mine was pretty great and included lots of R & R which is always a good thing. I know it has been a month or more since my last post, but my fault, I have been working of my upcoming accessory boutique, which will be going live at the end of July!!! Whoop whoop! This month I am also going on a MUCH NEEDED vacation to Turks and Caicos with some family and friends, which I'm super excited about!!! I am a huge lover of beautiful water and I can't wait to stick my feet in the water there and prance around the island in my cute swimmies!!! While getting ready for my trip I will be posting my vacation essentials that I will be taking with me. Everyone knows one major essential for a summer vacation is SANDALS, especially if you're going to somewhere tropical! This summer I have become addicted to the "Jelly" trend. From flip flops to t-straps and gladiator heels, I cant get enough of them. I've seen a couple different styles, but my favorite has to be these BCBG Generation Bow Jelly sandals that I bought in EVERY color (don't judge me)! You can find these cuties at HSN or Macy's. I will be rocking my sandals with my swimmies (swimsuits), maxi dresses, shorts, and skirts during my vacation. 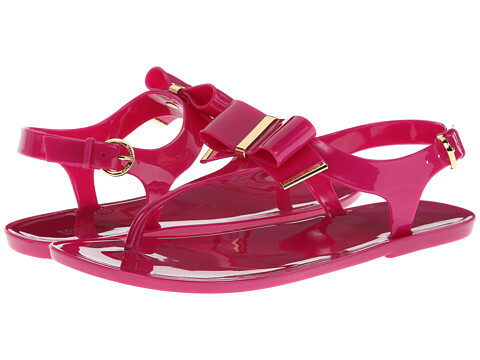 Check out these other fab jelly sandals. Stay tuned, as I share more of my vacation essentials with you over the next couple weeks!!! Stay FABULOUS!! !